This lovely brass pendant celebrates the winged symbol of transformation. Delicate and precise, the art of origami is steeped in romantic imagery and tradition. 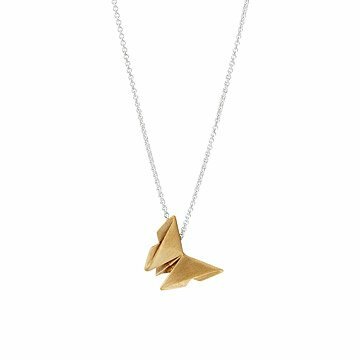 This lovely brass pendant celebrates the winged symbol of transformation while paying homage to the beauty of paper folding. This enchanting piece came to be after artist Andrea Panico was asked to design a custom pendant for a friend's wedding anniversary. At their wedding, hundreds of paper origami butterflies created an ethereal centerpiece, and so a beautiful metal replica served as the perfect commemoration. Using 3D software, Andrea created a mold and now hand casts each butterfly, finishing them with a beautiful matte surface. Perched on a sterling silver chain, each handmade butterfly look as if it's about to take flight, lending natural magic to your ensemble. Handmade in the USA. To prevent tarnishing of silver and brass, store in a plastic zip bag or in a jewelry box. If the jewelry does tarnish, lightly scrub the surface using a soft-bristled toothbrush with a mild dish detergent and water. If the tarnish is more severe, sterling silver chain can be dipped in a silver dip. Looked beautiful on my friend. This beautiful butterfly deserves a better chain! I love the short length and the color contrast of gold and silver. I get a lot of questions and compliments about this necklace. Nobody has ever seen an origami necklace. I like how unique it is and that nobody else has one. I wear my necklace every day.